Australian's are passionate about their sport and particularly so in Victoria, where some of the nation's best sporting events and stadiums can be found. From soccer to football and international cricket at the Melbourne Cricket Ground (MCG) or tennis in Melbourne Park for the Australian Open, whatever sport you're looking for you'll find a way to celebrate it in Melbourne. The Melbourne Cricket Ground (MCG) is Australia's premier cricket ground and is particularly busy in summer when cricket fever comes to town. Located in Yarra Park, the 'G' as it's affectionately known by the locals, is just minutes from the CBD and holds 100,000 fans. Built in 1853, the historic grounds have been revamped with a whole new stand and is also home to the Melbourne Cricket Club, Australia's biggest club. 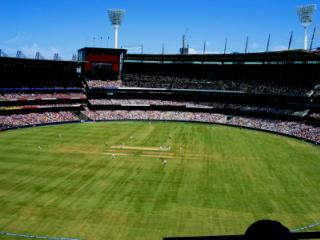 The Melbourne AFL Club is also part of the MCG and is another popular code followed by Victorians. Visit during AFL season and you'll notice the city is a kaleidoscope of colours as the locals proudly display their support in full club colours. The Kangaroo AFL Football Club meets in North Melbourne with services in Melbourne Olympic Park's Telstra Dome. Victoria is also home to a number of other major sporting events and venues including the Grand Prix in Albert Park Lane and Flemington Racecourse for the Melbourne Cup, the race that stops the nation. Melbourne Olympic Park is a versatile venue that us used for a number of local and international sporting events and with all sporting venues enjoying easy access by tram, train or ferry, there's plenty to experience in Melbourne and Victoria when it comes to sport.